High Output Alternators -- so tough, and so powerful, that we weld with them! The ZENA® mobile welding system is a new technology, self-contained, ultra-compact, commercial duty, engine-driven welder which can be attached to any engine. This welding system uses a unique, modular, electrically isolated power generator, which we at ZENA, Incorporated manufacture in the USA, to withstand the extraordinary stresses of continuous-duty high-current welding. provide on-demand onboard welding capabilities in addition to the DC charging / DC power supply functions noted above. They are also superior replacements for marine alternators. Need Even More DC Power? ZENA makes the only modular DC power generating units in the world. build high current DC generating systems that can produce a wide range of nonstandard voltages -- from 10 to over 120 VDC. Typically, the largest single continuous duty alternator that can be fitted into the engine compartment of a large vehicle is one producing a maximum current of around 200-250 amps. 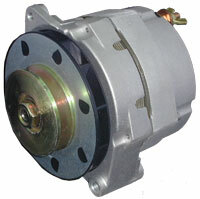 Small vehicles seldom have alternators producing much more than a maximum of 100 amps. Why? The waste heat that alternators can produce when heavily loaded increases dramatically as alternator output current increases. To deal with this heat, the alternator must become larger -- and, in some cases, also revert to liquid cooling. 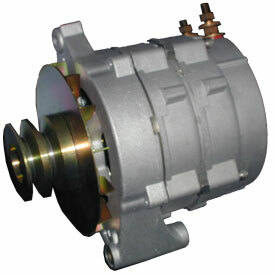 For example: An alternator producing 100 amps produces four times the heat of one producing 50 amps. A 200 amp unit will produce four times the heat of the 100 amp model -- eight times more heat than the 50 amp model! To deal with all this heat, a 300A air-cooled alternator balloons in size to be over a foot in diameter, and over eighteen inches in length -- much, much larger, and heavier, than a typical automotive alternator. This forces manufacturers of such ultra-large alternators -- typically used in busses and similar vehicles -- to resort to liquid cooling in order to make them small enough to fit into the very large engine compartment spaces found on this type of vehicle. This is why most emergency vehicles resort to split electrical systems using two, or even three, large alternators -- one dedicated to the non-stock electrical equipment installed on the vehicle and one (or more) dealing with the load of the vehicle itself -- OR to very complicated isolation mechanisms that allow the output of multiple alternators to be combined to supply power to a single large load. Our modular generators and special controls provide the perfect solution! Thanks to ZENA's unique DC generator technology, multiple alternators can be attached to the same engine -- and be controlled and used together -- creating a huge charging system -- just as if they were a single giant alternator -- AND WITHOUT producing huge amounts of waste heat! Think fitting a larger high-amp alternator, doing a multi generator installation, or installing a secondary alternator / secondary generator is impossible? If you have a very small vehicle, you might be right -- BUT you might also be quite surprised to find that it's not nearly as "impossible" as you first thought. Larger vehicles (including most emergency vehicles), boats, etc. make things much easier. We have a large selection of inexpensive generic / universal bracketing components than can facilitate a do-it-yourself installation. In addition, we also have a bolt together universal bracket than can further minimize bracket fabrication needs. And, if you have a truck (or even a vehicle which shares it's engine configuration with trucks made by the vehicle manufacturer) it's quite possible that we have a fully engineered bolt-in custom bracket set that will perfectly accommodate your secondary alternator installation -- sometimes even allowing bolt in dual secondary alternators. The typical alternator is just not built like a ZENA DC power generator -- a key reason why we make this distinction rather than referring to them simply as alternators. The most significant difference is that unlike standard high-amp alternators most of which are designed to produce their rated maximum current for only a relatively brief period (usually less than 10 minutes, or so), ZENA power generators are built to produce higher currents CONTINUOUSLY --- an absolute necessity for welding -- but also a critical feature for big charging jobs. Select this hyper link to learn more about how ZENA power generators differ from standard high current alternators. Customer service is key. Not only do we make the finest alternators of their kind, we also provide world class service -- the old fashioned kind, where we treat you just as we would wish to be treated. CLICK HERE to read a bit about how our customers view us. ZENA power generators are sold with a three year limited warranty which does not exclude commercial or marine use. And our guaranteed overhaul / rebuilding cost policy further protects your investment in our equipment. Just try to find a high output alternator anywhere with a warranty -- or an overhaul/rebuilding policy like this! Buy risk free using our Online Store -- or call us today to order a unit (615-897-2011). ZENA® is a trademark owned by ZENA, Inc. for its welding systems and related products. © Copyright 2000--2017 by ZENA, Incorporated. All rights reserved.